After making her first holy communion on the 3rd of June 1858, on Corpus Christi, Bernadette Soubirous continues to go to school at the hospice. In June 1860, the priest Peyramale authorises her to become a resident. She takes care of the household and of the patients. In 1862, she starts thinking about becoming a nun. She gets full support of the Sisters of Nevers. 2 years later, she applies to become a nun at the Nevers motherhouse. She is 20 years old and can no longer bear the curiosity she creates around her. On the 2nd of July 1866, Bernadette leaves for Nevers. At the convent, she receives an equal treatment to the other nuns (and sometimes a worse one). She tells her story once for all and the other residents are not allowed to ask her any questions about her story. Bernadette, called Sister Marie Bernard works a lot: house chores, nursing... she keeps her simplicity, but her health is more and more fragile. Her asthma exhausts her. She writes a letter to her parents and begs them not to get richer. She dies in Nevers on the 16th of April 1879, aged 35, without coming back to Lourdes. 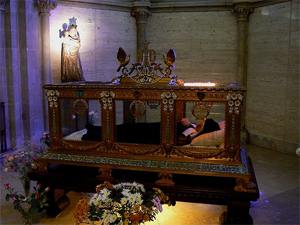 30 years after her death, her body was exhumed to proceed to her beatification. The latter was found intact and will cause perplexity among the doctors. A few years later, Pope Pius XI gives her the title "Blessed": she is beatified. Later on, Pope Pius XI will also canonise Bernadette, who becomes Sainte Bernadette. Today, Bernadette's body rests in a reliquary in Nevers, in a little chapel open to the visits. Read the articles about Bernadette: her childhood in Lourdes and the apparitions in the Massabielle grotto.